Often the biggest challenge in financing a new vehicle is the down payment. Ford has a program to help! 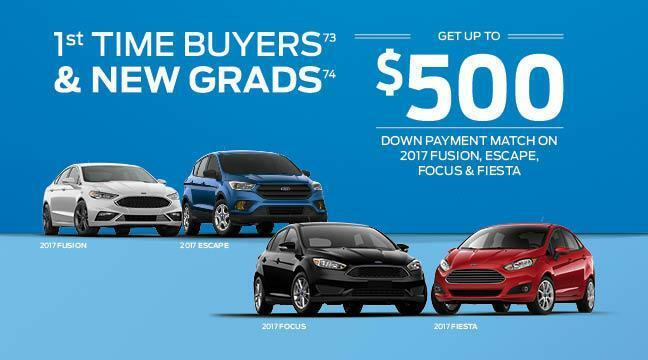 Thanks to the First Time Buyers Program, Ford of Canada will provide a cash incentive equalling your vehicle down payment (up to a maximum of $500) on a new 2018 Ford Focus, Fiesta, Fusion EcoSport and Escape. Congratulations new graduate! Ford of Canada is offering a $500 Graduate Rebate to eligible graduates* who purchase, lease or factory-order an eligible new vehicle. Drive into your new life in a new 2018 Ford Focus, Fiesta, Fusion, EcoSport and Escape. The finance team here at Belanger Ford are experts when it comes to automotive financing and have close relationships with a range of banks and other financial institutions. There is a pretty good chance we can secure you financing for your next vehicle. Fill out our CONTACT FORM, visit or call us at 705-855-4504 today to learn about this great offer!